I had dim sum with several people from work, for a goodbye lunch for Beeta. 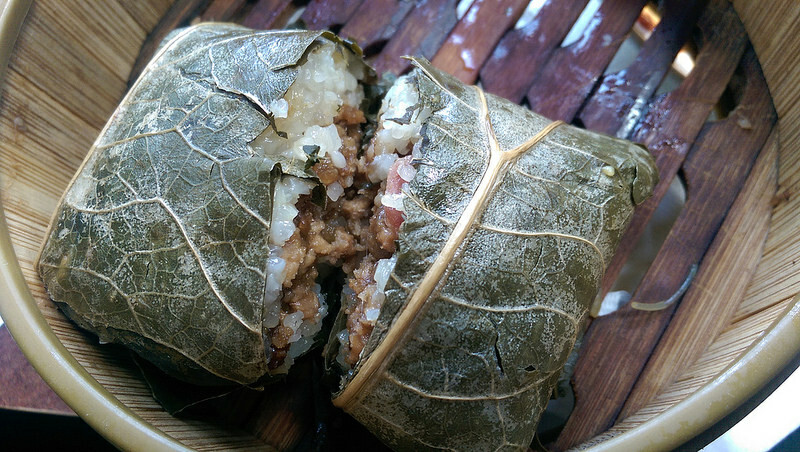 One of the items we had was lo mai gai, also known as steamed sticky rice or glutinous rice in lotus leaf wrap. The one we had also contained chicken, Chinese sausage, and mushroom. Lo mai gai is mostly a southern Chinese food. It contains glutinous rice filled with chicken, Chinese mushrooms, Chinese sausage, scallions, and sometimes dried shrimp or salted egg. The ball of rice is then wrapped in a dried lotus leaf and steamed. Sometimes lo mai gai is divided into smaller wraps, which are known as chun chu gai (Cantonese; 珍珠雞) literally meaning “pearl chicken” in Chinese. Due to the flexibility of the lotus leaf, lo mai gai is typically wrapped to form a rectangular parcel. The Grub Files: Cooking with Camissonia has a pretty neat pictorial of making lo mai gai; check it out! now that does look delicious!! !